Varnitha Siva is an antitrust associate in the firm’s New York office. 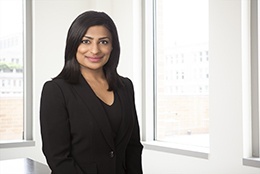 Varnitha represents clients before the U.S. Department of Justice and the Federal Trade Commission in merger reviews and government investigations. She has represented clients in industries including energy, health care, telecommunications, defense, pharmaceuticals, and food & beverage products. Varnitha received her JD in 2013 from Howard University School of Law. During law school, she was a Law Clerk at the Federal Trade Commission in the Office of Commissioner William E. Kovacic.